Palm trees are susceptible to infections that cause fungus spots on leaves. Spots are a symptom of a more severe underlying disease that may be wreaking havoc on the health of your tree. Provide proper care to your palm trees to keep them vigorous. Familiarize yourself with characteristics of fungus on palm trees as well as an effective control method. Since there are many species of the palm tree, determine which tree you are growing and research particular care requirements. Healthier trees are less likely to suffer from infection and are more prepared to fight for their health. For vigorous palms, plant in locations that offer full sun to light shade, according to the Clemson University Extension. Palms prefer well-drained, slightly acid soil high in organic content. Leaf spots are caused by one of a wide variety of fungi including, but not limited to, bipolaris, cercospora, exserohilum, pestalotia and stigmina, according to the University of Florida IFAS Extension. Leaf spot symptoms are very similar for each fungus, so determining which pathogen is responsible is difficult. Fungal pathogens spread sporadically, often through wind and rain, and tend to infect younger less established palms, though all palm trees are susceptible. The first symptom to look for on palm leaves is the presence of fungus leaf spots that appear saturated with water. The spots may be gray, yellow brown or black, according to the University of Florida IFAS Extension. The spots are often encircled with a contrasting color, like a black center with a yellow border. The plant tissue within the spot dies and may leave a hole in its wake. In severe cases, damage includes death of entire leaf blades. Avoid overhead irrigation of palms as wet leaves provide an ideal environment for fungi to stop and germinate, leading to infection. When using pruning tools, sanitize between each cut and from one plant to the next to prevent the easy spread of disease. Palms often infect other palms, so take caution when planting new palms; buy disease-free plants and check the surrounding area before planting. 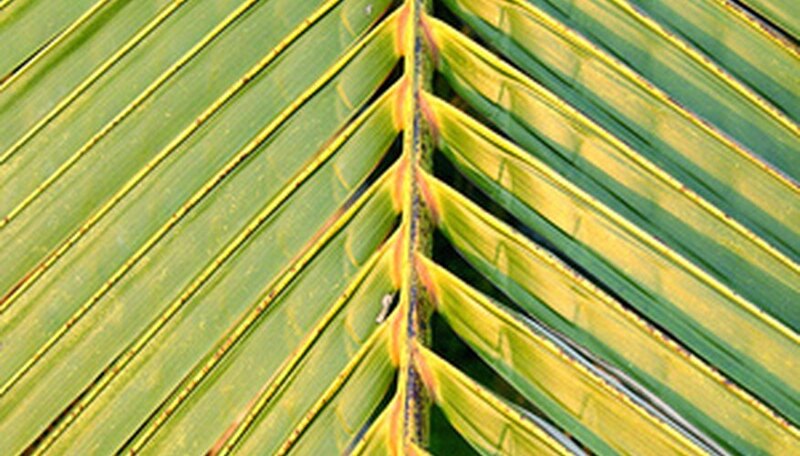 Additionally, some palms suffer from nutrient deficiencies which leave them more vulnerable to infection, so maintain proper care at all times, according to the University of Florida IFAS Extension. In conjunction with natural control methods, application of chemical fungicides provides effective control of fungus leaf spot on palm tree leaves. Though fungicides will not cure your plant, they will control the problem and prevent further disease spread to other parts of the plant and to nearby palms. Remove and destroy affected leaves before chemical application. Employ the use of fungicides with the active ingredient chlorothalonil or mancozeb for effective management, according to the University of Florida IFAS Extension.